We’d had Theo for about a year to 18 months around this time, and we noticed that he was limping. We found ourselves in a cycle of letting him off-lead and then every few weeks he’d simply not come back until he was good and ready. One time, I’d let him off at a place call High Elms near Bromley and he went for over an hour. Unfortunately, he didn’t seem to be able to contain his excitement and would work himself up so that he would simply not respond to instructions, or be tempted by tasty treats. He would run and run until he exhausted himself. We took him to the vet, who referred us to a clinic who conducted scans and examinations. We were told that he had elbow displacement which was the cause of the limp. The recommendation was for hydrotherapy. We found a wonderful place near Guildford called Greyfriars. 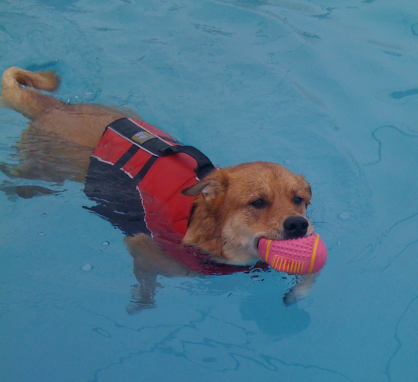 Unlike other recommended hydrotherapy centres, Greyfriars had a large pool and offered assistants who would be in the water with him to ensure he was safe and the experience was controlled. The staff at Greyfriars are fantastic, and their love of animals is evident. In fact Theo was so keen on the lady who looked after him for the first sessions that we called her his girlfriend, as his tail would wag incessantly. Although the Theebs is not a natural in the water (despite his webbed lab paws), he did enjoy his time in the water. He even learned to play ‘fetch’, which I would have thought was natural for a dog, but until he played in the Greyfriars pool, if you threw a ball or stick for him he would occasionally chase it, but never bring it back.